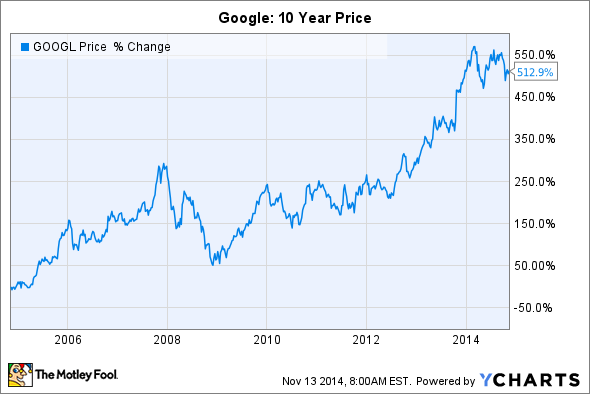 Where Will Google Stock Be in 10 Years? Will Google stock trend higher or lower over the next decade? Over the past decade, Google (NASDAQ:GOOG) (NASDAQ:GOOGL) stock has soared over 500%, fueled by the growth in search and mobile devices. Google now controls 58% of the world's Internet searches and 85% of the mobile market via Android, and it continues to disrupt Microsoft's (NASDAQ: MSFT) business with free operating systems and cloud-based software. But 10 years from now, will Google's growth stall out, giving other companies a chance to take the lead? Or can it keep expanding into new markets to find new sources of revenue growth? Google might seem to be a ubiquitous brand, but its business is still vulnerable to disruption. One soft spot is social networking. In 2004, Facebook (NASDAQ:FB) arrived, eventually taking over the world with 1.35 billion monthly active users (MAUs). That same year, Google launched its first social network, Orkut, which never caught on outside of Brazil. Google finally launched Google+ in 2011 to catch up to Facebook. Registered Google+ users soared from 359 million to 1.15 billion between 2012 and 2013, but only 343 million of those accounts are currently active, according to tracking site We Are Social. That weakness is troubling, since Facebook clearly wants to evolve its social network into a full-blown mobile OS. Last April, Facebook launched Home, a replacement launcher which turned select Android devices into "Facebook phones." Facebook also unbundled Messenger as a stand-alone app to compete against other mobile messaging services. Facebook's large percentage of mobile users (83% of is MAUs last quarter) could convince the company to launch of a forked version of Android (similar to Amazon's Fire OS) within a few years. If a "Facebook OS" gains enough hardware and software support, it could ruin Google's day by crippling its ability to monetize Google Play. Google's other weak spot is product search. Google's prior effort, Google Shopping, listed merchant-submitted prices for free, but growth stalled in 2012, when Google started charging for listings. Google didn't have the leverage to make such a demand -- Google Shopping only handled around 80 million product searches, compared to 900 million at eBay (NASDAQ: EBAY) and 335 million at Amazon (NASDAQ:AMZN), at the time. Google's new plan, Google Express, offers same-day deliveries from bricks-and-mortar partners for $95 per year. It's a clear response to Amazon's free two-day delivery service for Prime members, who pay $99 per year, and its new Prime Fresh same-day grocery delivery service, which includes Prime benefits for $299 per year. The number of Prime members has more than doubled from 20 million confirmed members in January to 50 million estimated members (RBC Capital) in September. Amazon's Kindle and Fire TV devices are sold on a razor to razor-blades model -- the cheap devices are the razors, while Prime subscriptions and digital/physical purchases are the blades. Research company Customer Intelligence Research Partners recently found that Prime subscribers spent twice as much money as regular customers, while Kindle users spent 30% more than non-Kindle owners. In the long run, Google can't compete against this business model by simply hiring a fleet of contract drivers. Looking ahead, Google has invested in military robots (Boston Dynamics), artificial intelligence (DeepMind), healthcare (Calico, Baseline, devices), and smart cars (Android Auto and driverless cars). Ten years down the road, several of these projects will inevitably flop, but others will flourish. Google's ventures into military robots, which conjure up dystopian visions of Skynet, probably won't become more than a niche business for the company. But Calico, its biotech subsidiary, could become a major source of revenue if its experimental drugs for "age-related diseases" are approved. Calico has already signed a deal with AbbVie (NYSE:ABBV), worth up to $1.5 billion, to discover and commercialize new treatments. In the auto market, Google will leverage Android's dominant market share to expand into car infotainment systems with Android Auto. However, its driverless cars don't look as promising. The problem is that Google's fully automated system requires the detailed remapping of streets, while other half-automated systems -- like MobilEye's (NYSE: MBLY) ADAS (Advanced Driver Assistance System) -- can detect and react to surroundings accordingly. This makes it a more practical choice for automakers and drivers who don't want to be confined to Google's "smart grid." Mobileye's crash avoidance systems start at less than $1,000, compared to Google's prototype cars, which are outfitted with around $150,000 in equipment. Over the next 10 years, Facebook could threaten Google's lead in mobile devices, while Amazon could hinder Google's efforts to expand into product searches and home media consumption. That competition could cause Google's growth to level off, forcing it to invest more on new projects to push back. But if any of Google's "wild card" investments work, Google could evolve into a massive tech giant that straddles the healthcare, tech, and auto industries at the same time.